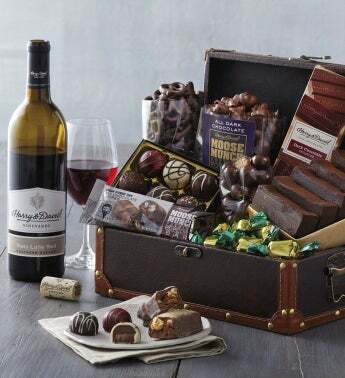 Surprise someone with a wonderful keepsake wooden chest brimming with indulgent sweets and a bottle of Southern Oregon wine. This gift includes buttery Moose Munch® Premium Popcorn and rich signature truffles from our candy kitchen, and a mini chocolate decadence cake from our bakery. All of these gourmet treats pair beautifully with a bottle of Harry & David™ Royal Crest Red Blend wine.